I have made clothes for myself and others for all my adult life. This activity is by it’s nature collaborative, where fittings can trigger changes not imagined at the outset. It’s a process. With UNIFORM I am continuing in this quest to get dressed effortlessly in garments that fit my body and my life. Clothes that will carry me seamlessly through my days from bike to studio to meetings and outings. Quite a lot to ask. But why not? Starting with myself I am developing a series of everyday garments that work for me. My uniform. Along the way I am learning about the garment and textile industry, international trading relationships and how there are so many more clothes in the world than people to wear them, and yet we can’t get enough. Why? 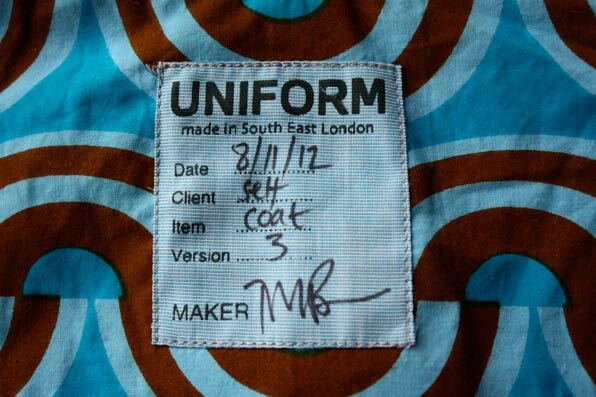 The cloth I use is unused stock from relatively ‘high end’ production. I am dependent on this global trade for the supply of beautiful cloth for my practice. We all are. I make UNIFORM for others too. It is possible to commission versions of garments that I have developed for myself, or maybe new versions of a favourite piece. Or even develop items specifically for your bodies and your lives. Bodymapping is a method I have developed to create patterns by using a person’s body which is a basis for UNIFORM. It involves sculptural methods and almost no measuring. Size did not exist prior to mass production. I teach this workshop.